This is an outfit that I wore a couple days ago, but haven’t been able to share it. 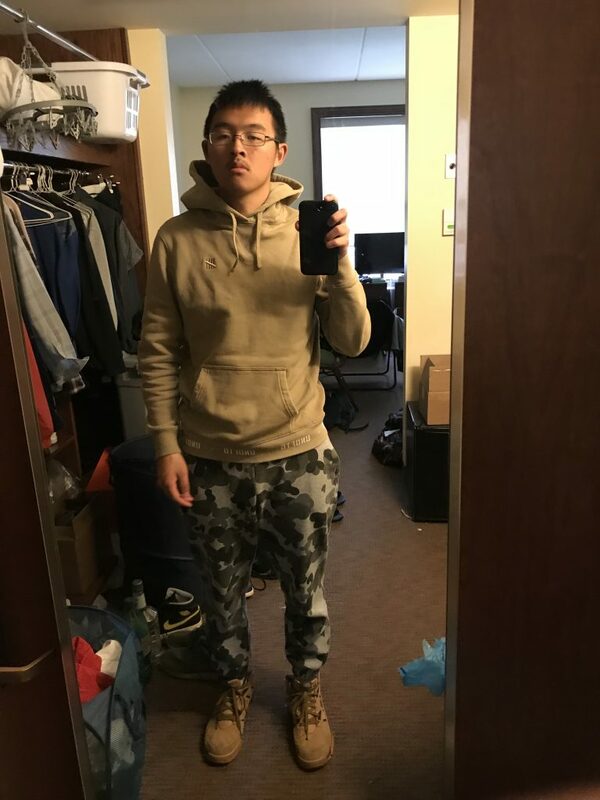 But here it is, a simple tan hoodie and camo jogger-pants with boots. Both the hoodie and pants are from the streetwear brand Undefeated. While they aren’t the more well-known brands Supreme and Bape, the pieces that Undefeated releases are very aesthetically pleasing and dope to rock. Just because they are the same brand doesn’t mean that the clothes should go together. But in this case, the contrast works with the tan color and the black/grey/dark grey colorway of camo pants. This fit represents me since it has a low key top, but is expressive enough to be noticed. In addition, for the footwear, I am wearing my Nike Sneakerboots again. On this particular day, it was raining, so it was appropriate to wear something that would keep my feet dry. I like how a lot of times people wear a louder top with simple bottoms but you switched it up and made your pants the center of attention! I always feel like that’s hard to do, so props to you for making it work and working it well! The matching between the boots and the sweatshirt and then the style cohesion between the boots and pants make the entire outfit work together really well!